Bad advertising is the fun pause that refreshes here on UsefulArts. Found the the worst law firm ad ever, and helped get it pulled down. Treated the airport as a museum of misfit ads. Pointed out that UPS has a pretty bad tagline. Chronicled the offensive or silly use of President Obama’s image (you be the judge). Our fifth ad advertising foray takes us to the grocery store. Some of the finest talents in consumer-packaged goods design and manage Kellogg’s cereal boxes. The cereal aisle is tough, because it is hyper-competitive, and because the packages must connect with adults and kids with radically different (and often preposterous) value propositions. 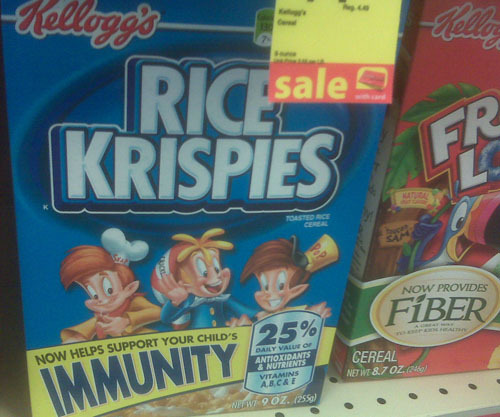 Does Rice Krispies really help my child’s immunity more than, say, fresh fruit? And though Froot Loops now provides fiber, isn’t it still loaded with crap that most adults wouldn’t intentionally feed to their kids? What’s a better source of fiber: “Fruit” or “Froot”? Go ahead, pick any froot. And (for any Kellogg’s staff now joining us) good job on including the vitamin source of your antioxidants, as required by the FDA, in a way that makes it look like an additional nutritional claim. Poetry in packaging persists. Kellogg’s Soylent Green, Now With More Girls! Wieneke’s first law of advertising is to avoid associating your product with death. Perhaps a derivative of this should be not associating food products with illness. 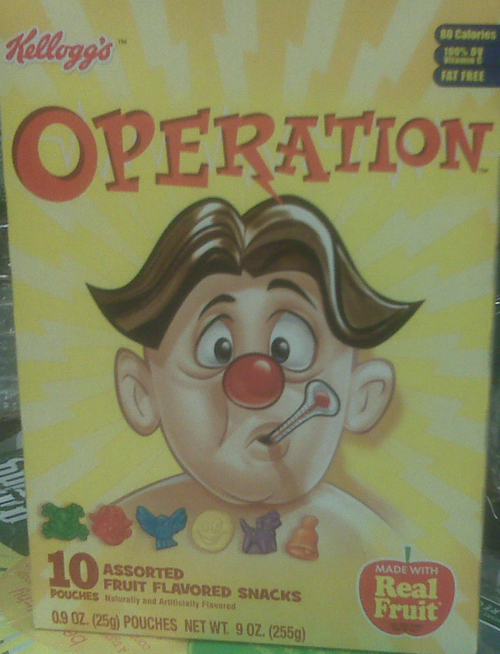 Somewhere, a brand manager loved this wacky retro game enough to willingly put a cartoon of a sick person on their package, and the giant word “Operation” across its top. Isn’t Operation a game where you win by pulling parts out of a patient’s body? Look at the man’s face: does it say “eat my remains” or “stay away“? Even though it’s made with real fruit, the rest of this design screams medical waste. Are there ads that just seem wrong, or that need further comment? Let me know on Twitter, or by email: strategy2.0<at>gmail.com. I’m always glad to get ideas, guest posts, and encouragement for a brief respite from online marketing law. Are Ads for “Fake” Complaint Sites False Advertising? 5 Responses to "Bad Advertising Part 5: Kellogg’s Cereal Killers"
I’m running out right now to buy some Froot Loops to help boost my kids’ fiber intake (NOT)! Gotta love it!